PALMDALE – In the early hours of Thursday, September 5, smiling Anaverde Hills School students enjoyed a walk to their campus. At each street corner, more students waited to join the group on their way to school. The walk was part of the Westside Union School District’s Walking School Bus, a student health and safety program presented in partnership with Don Parazo and the High Desert Medical Group. “We are very excited to bring this program to Anaverde Hills. It really helps to strengthen our community here at our new school,” said Kristin Frye, Anaverde Hills School Principal. The students were accompanied on their walk down Parkwood Drive, in the Anaverde community, by parents, Principal Frye, Palmdale Mayor Jim Ledford, and Sheriff’s Deputies on bikes, motorcycles and in patrol cars. Parents were invited to a short meeting in Anaverde Park, next to the school, after dropping the students off. Parents were invited to a short meeting in Anaverde Park, next to the school, after dropping the students off. Parents heard from Regina Rossall, Westside Union School District Superintendent, Principal Frye, Mayor Ledford and representatives of the High Desert Medical Group, Anaverde HOA, Sheriff’s Department and the City of Palmdale in the meeting. Dori Petersen, President of the Anaverde HOA lauded the program and pledged her participation in it. “I’ll be walking my grandson to school,” said Petersen. She also told the group that the walk to school provides more than just safety and health; it is an opportunity to spend quality time with the children. This was the final of three kick-off events held across the Westside Union School District. Parents wishing to volunteer with the Walking School Bus program should contact their school. 4 comments for "Students, Mayor, walk to school"
Good thing you do not sit on any boards that I know of Jason, your a simpleton train wreck waiting to happen. Must be off your meds again. Actually Palmdale and Lancaster from research shows they rank dead last in the County of LA for sidewalks for children. No my train is on the right track but the community is not. It has very low community standards. Why do you think AV is known as the “okie ghetto” of LA. Open your eyes travel Ave R From 47th st East to Division St. GHETTO no side walks bike lanes 4 schools. I can name a dozen more. HAVE SOME Gutts!!! post your real name if your going to insult someone. Half the schools in Palmdale and Lancaster don’t even have safe sidewalks or bike lanes going to the schools for students to walk safely to school. Yet the city and schools say the care about kids. Not to mention the parks. Who sits on these boards who elect them??? 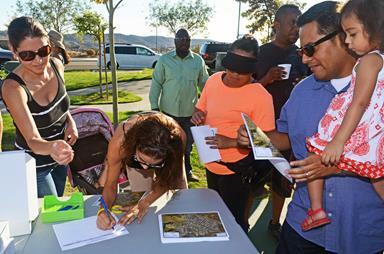 There are xlnt sidewalks in Lancaster and Palmdale. Littlerock not so much.